Today Amazon has added a new Kindle to their line-up, the Kindle DX. This Kindle sports a 9.7-inch screen that uses the same e-ink technology as the Kindle and Kindle 2, which supposedly makes the screen as easy to read as the printed page (though it also means there is no backlight, so if you like to read in a dark room you’ll still need your Itty Bitty Book Light). The $489 Kindle DX adds three big-ticket items to the usual Kindle features (those being wireless connectivity without a contract and access to Amazon’s library of about 270,000 books, newspapers, magazines, and blogs). First up is native support for PDFs. Thanks to the new larger screen you won’t need to zoom or pan to view PDFs on the Kindle DX, and you won’t have to use Amazon’s PDF conversion process either (Kindle 1 and 2 users will still need to send PDFs to Amazon and have them converted to be readable on the older Kindle devices). In addition, much like your iPhone, if you rotate the Kindle DX the screen will rotate as well. This is intended to make looking at any landscape-oriented documents—as well as large pictures and maps—a more pleasant experience. The new device also features more storage. The Kindle 2 has 2GB of internal storage, which can hold about 1,500 books; Kindle DX has 4GB of internal storage that can hold up to 3,500 books. Amazon also announced that they have partnered with three major textbook publishers (Pearson, Cengage, and Wiley) to have Kindle DX versions of textbooks available when the Kindle DX ships. Five schools have agreed to pilot Kindle DX usage on campus, so if you’re a student at Arizona State University, Case Western Reserve, Princeton, Reed, or the University of Virginia’s Darden School of Business, you might be sporting a Kindle DX come this fall. 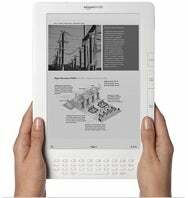 Amazon is also partnering with the The New York Times, The Washington Post and The Boston Globe to provide Kindle DX-formatted versions of their papers at a special price, though pricing hasn’t been released for these products yet. However, the price will only be available to those customers who live outside of the home delivery area for the papers. All of this for the low, low price of $489; the Kindle DX is scheduled to be available sometime this summer. Alright, that’s not as low as some people thought it might be, but then again when are people ever happy with device pricing?